publicly display (no putting them online), or create derivative works from photographs. Copyright infringements—reproducing photos without permission—WILL result in civil and criminal penalties. Image 1st will not use your images for any of our promotional material without your prior consent. IMAGE 1ST LLC provides copyright of your images to you for personal use ONLY. You have rights to print your images, share with friends and family and post on social media personal pages ONLY. You DO NOT have the right to use your images for business purposes, promotional material in any media, sell your images, broadcast your images, use images in advertising or trade, or use your images in any business related social media. You can purchase the copyright to the above for an additional pre-negotiated fee. Have you ever fancied a break from the norm? As we know pampering yourself boosts your self-esteem and can add at least 10 more years to your life! It's not all about work, work, work you know! 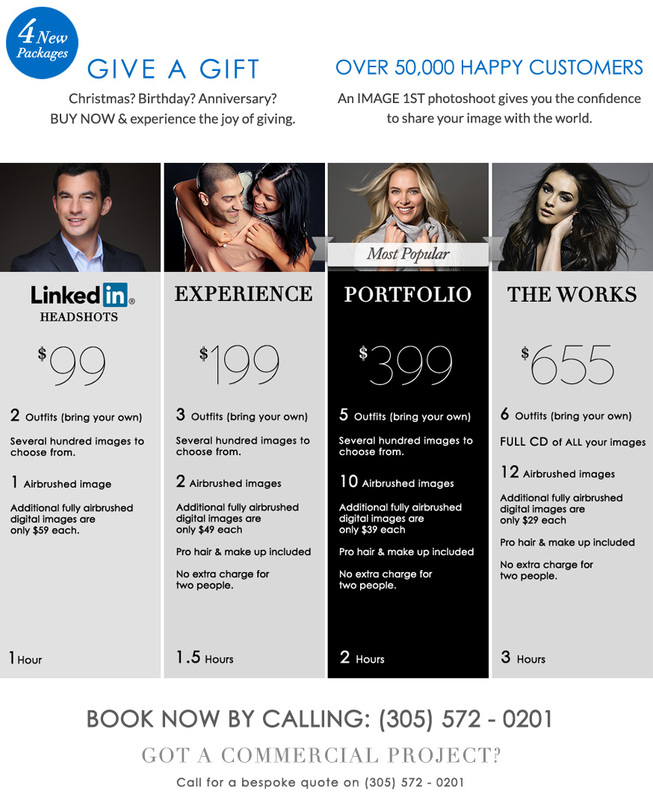 At image 1st Miami we love photography, and with the help of our London based photography studio we have created some awesome makeover photo shoot packages for you to enjoy with our professional photographers in Miami. You simply choose the photography style, can be anything from a fashion photo shoot to a wedding photo shoot, but don't limit yourself, our photographers in Miami can always mix and match to give you added variety to your photo shoot in Miami. Professional makeover photo shoot in Miami lasts for approximately 2½ to 3½ hours depending on which option you choose. We recommend you opt for a makeover with one of our professional hair and make up artists, as this always compliments the work you'll be doing with our photographers in Miami. The Miami makeover photoshoot has been designed to fully maximise the time spent with you to ensure your professional makeover photoshoot in Miami is personal to you. Soak up the creative atmosphere, with countless scenes and backdrops as well our professional photographers in Miami take you through the motions. As you can see by our Miami photoshoot gallery, we take photography incredibly seriously as we just love capturing your imagination through our lenses! Unlike many photography studios in Miami, there is no hard selling or hidden photography costs at the end of your makeover photo shoot at image 1st.